(mV) sources. It is offered with HART Communication Protocol. Field-proven microprocessor-based transmitter ensures accurate measurement and performance. Remote Communication with HART Communicator or PC-based Configurator. Dual, independent sensor input capability for difference/average measurement, or sensor backup. 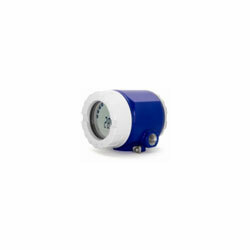 Backlit indicator with measured value, bar graph, and fault indication displays designed for ease of reading. Drift alarm, sensor backup, and sensor corrosion detection enhances reliable operation. Sensor input-to-output galvanic isolation of 2 kV. Operation voltage monitoring for high measurement performance. Compact, dual compartment enclosure with fully potted electronics. Enclosure meets IP67 and NEMA 4X ratings. The stainless steel enclosure meets IP66/IP68 and NEMA 4x and NEMA 6P ratings. Aluminum or 316L ss housing offered to meet user’s specific requirements. Approved/Certified by many testing agencies for use in hazardous area installations. Stainless steel mounting bracket sets offered for surface and nominal DN 50 or 2-in pipe mounting.